Good leaders walk a tightrope between doing and daring – often in the glare of the public spotlight. 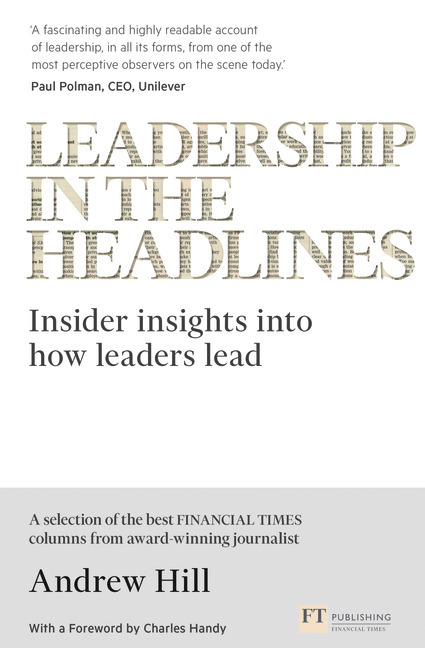 In Leadership in the Headlines, Andrew Hill, the award-winning Management Editor of the Financial Times, shares his insider insights into the who’s and how’s of effective leadership. Packed with practical lessons, this book divides the best of Andrew’s wry and insightful columns into eight ‘acts’ of leadership, with new commentary enhancing each one. Whether you’re new to Andrew Hill’s columns or a loyal reader, you’ll gain fresh perspectives on the tough job of leading and take away tips about how to refine your own management skills. Andrew Hill is the management editor of the FT. He writes a weekly column on developments in business, strategy and management, as well as contributing feature articles, videos, podcasts and blogs. He was named Best Commentator at the 2009 Business Journalist of the Year Awards, whilst receiving the Decade of Excellence award for sustained achievement in business and financial journalism.